I am often asked about using BeerSmith for Craft brewing and in fact BeerSmith is used by a large number of commercial breweries. Also, many passionate home brewers who make the leap from home to professional brewing then write and ask how to scale up from 5 gallons to 3 barrels or more? So I thought I would provide this article to explain the process. Most craft breweries develop and test recipes on a “pilot” brewing system, which can range in size from 5 gallons (19 liters) to several barrels in capacity. Even for professional brewers, every idea they have in beer may not be a great one, so the pilot batch lets them test and perfect a recipe before scaling up. They don’t want to be left with an experiment that went wrong on a commercial scale. Commercial brewers maintain two equipment profiles in BeerSmith – one for their test/pilot system and one for their production system. Then they use the “Scale recipe” command and select the larger system to scale their recipes up to full scale. Hop utilization is much higher at craft brewing scales, because large boils simply extract more bitterness. This is the largest change that hits most new craft brewers. If you simply scale up a 5 gallon (19 liter) batch to craft brewery sizes you will get a beer that is way too bitter. The “Hop Utilization Factor” listed in your equipment profile is the number you adjust to correct this. By default it is 100% for batches under 20 gallons (80 liters), but it can easily be 125%, 150% or possibly more for a multi-barrel brewing system. Unfortunately I can’t offer a hard guideline here since each system is different, but you can consult the manufacturer or other brewers using similar systems to get a starting point for scaling your hop utilization. 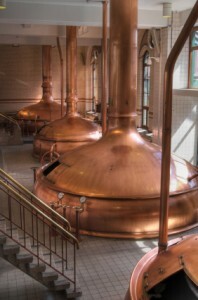 Brewhouse/total efficiency is usually higher for a commercial system – perhaps 1-5% higher depending on the system. This is due to the fact that you will often get better extraction of sugar from the wort both in the mashing and lautering phase that you get on a small pilot system. This is a number you may have to dial in a bit as you gain experience with your particular setup. For really high gravity beers (like barley wine or imperial IPA) you may need additional adjustments to total efficiency (usually downward) for that particular recipe since the mash efficiency and efficiency scaling can be much different than a traditional brew. This is due to the fact that you are mashing/sparging with significantly less total water relative to the amount of grain you have added to this large batch. This is an effect you will also see on smaller batches – your brewhouse efficiency will go down for very high gravity beers. profile and scale everything up. Thanks for joining me on the BeerSmith Home Brewing Blog. You can get a trial version of BeerSmith here if you don’t already have one. Be sure to sign up for my newsletter or my podcast (also on itunes…and youtube…and streaming radio station) for more great tips on homebrewing. Please let me know through email if your question has not been answered. Nice info, Brad. I’m using RIMS on a small scale (half barrel). Is RIMS used in commercial brewing? Is there a scale above which RIMS cannot/should not be used? I think I recognize that picture – is that the old Pabst brewhouse at Brewhouse Inn & Suites in Milwaukee? Hi, Brad. I know that the hop utilization can/should be changed in the equipment profile for scaling up from >20 gallons to a commercial sized system. But does that utilization factor also affect scaling for hops used for flavor/aroma? From the research that I’ve been doing, those should scale proportionally with the grain bill.